Did we get your full attention? Yes, the title sounds rather intriguing, doesn’t it? But seriously speaking, you CAN look poised even when your temper is on full throttle. Just take a cue from our muse for today – Kristen Bell. The actress was spotted arriving at LAX recently, and judging from the snapshots below, it was quite obvious that she had a long and grueling flight. But alas, after touching down, she still had to wade through a pool of prying photographers who tried really hard to bug her. Celebrities are just like us, they’re human beings capable of losing their temper. And in Kristen’s case, well, she lost it; sort of, anyway. She purposely thrust a bag into the face of one of the photographers to keep him from flashing his camera. Thankfully, she managed to look poised and put together during the whole scene — and we’d like to give her houndstooth-patterned wrap and edgy leather-trimmed jacket credit for that. Both pieces polished her outfit to a certain degree, even though she had no make-up on. The wrap, in particular, elevated her style and made her look more elegant. So basically, that’s the lesson for you. Always take time to polish up a look with a scarf or chic topper. 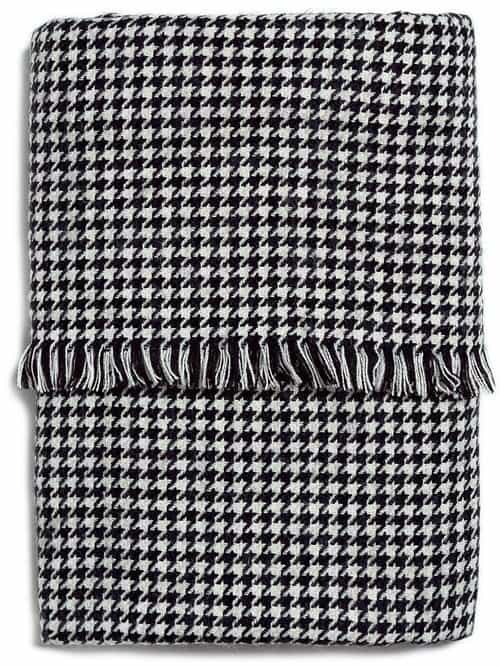 Kristen chose a very traditional houndstooth pattern in classic black and white to dress up her casual attire. We don’t have any information on the cozy extra at the moment, but here are two options for you from Echo Design and Zara if you don’t mind grabbing something similar. 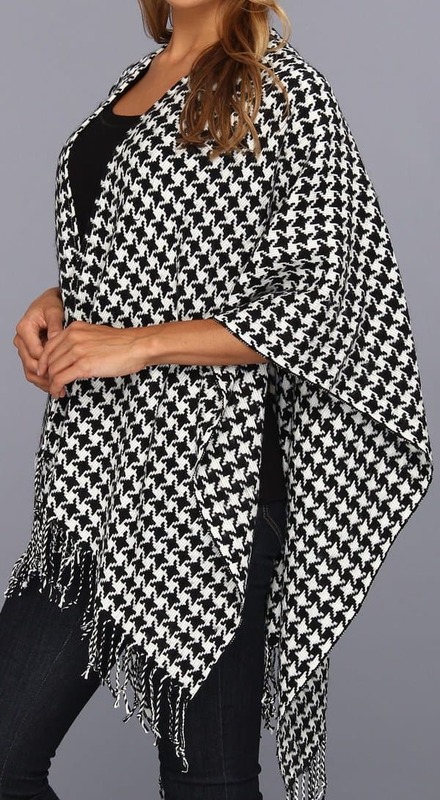 The one from Echo is actually a ruana, or more like an open-front poncho. 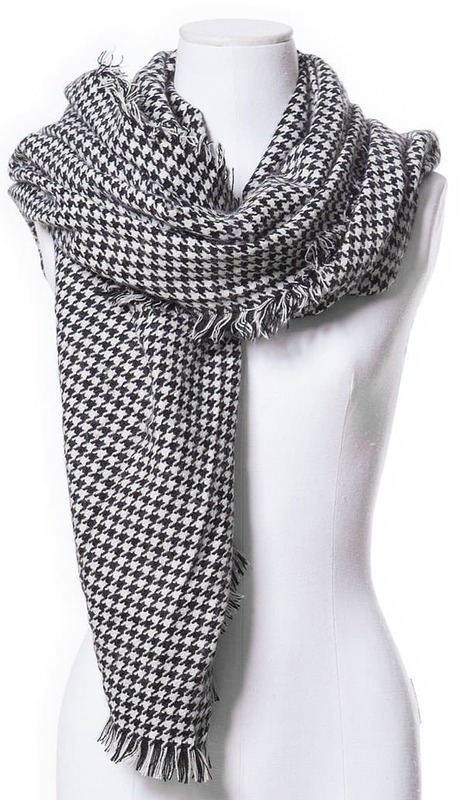 The second option is a scarf from Zara, which happens to look exactly like Kristen’s scarf. 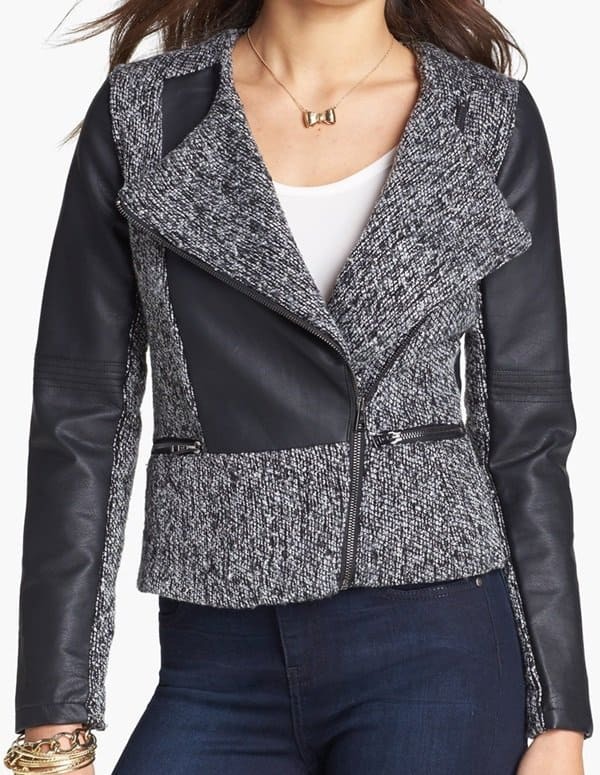 Wear any of these pieces with the leather-trimmed jacket from Dollhouse (below) to get the full effect.